Callicarpa 'Profusion' is a deciduous shrub with purple tinged green leaves that turn gold in autumn and clusters of tiny purple flowers in midsummer. 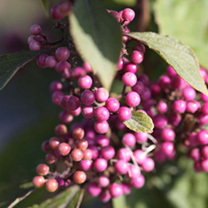 The main attraction of this shrub, however, is the metallic purple berries that appear in autumn. As the berries are extremely bitter, they remain untouched by wildlife well into winter. Flowers July. Height 150-200cm. Supplied in a 7.5-10 litre pot. Callicarpa 'Profusion' is a deciduous shrub with purple tinged green leaves that turn gold in autumn and clusters of tiny purple flowers in midsummer. The main attraction of this shrub, however, is the metallic purple berries that appear in autumn. As the berries are extremely bitter, they remain untouched by wildlife well into winter. Flowers July. Height 150-200cm. Supplied in a 3 litre pot or 7.5-10 litre pot.